Today I'm drinking Spring Fling Ale brewed by Blue Point Brewing Company in Patchogue, New York. 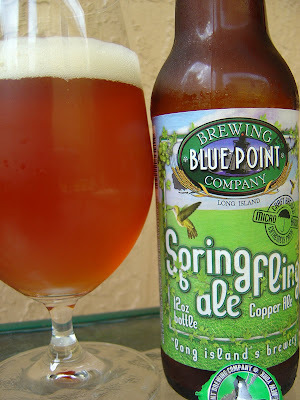 The brewery refers to themselves on the label as "long island's brewery" atop a nice spring scene filled with lots of green grass and a handful of hummingbirds. A badge says "Craft Brewed, Extremely Fresh" with an umbrella in the middle. Malty bread and spicy aroma. Caramel and bread malty flavors start things off but a lemony citrus bitter burst is right around the corner waiting to pounce. The carbonation is high and noticeable right from the beginning as well, a little prickly. There is a small medicinal flavor and a hint of spice in there before you end with a dry bitter aftertaste. Refreshing. Not bad. Pro Tan Spring Fling Advanced Triple Bronzing Tanning Lotion 9.5 oz. I had this one a couple of weeks ago, and agree with your review. Good solid Summer time brew. I would definitely drink it again, but wouldn't necessarily go looking for it.